Is our One Great Love provided by destiny or do we get to choose? This is the premise of the upcoming movie One Great Love, produced by Regal Entertainment, Inc. and an official entry to the upcoming 2018 Metro Manila Film Festival. Every year, Regal Entertainment, Inc., creates an entry/entries to the annual film festival to adhere to its commitment in bringing quality entertainment for moviegoers. 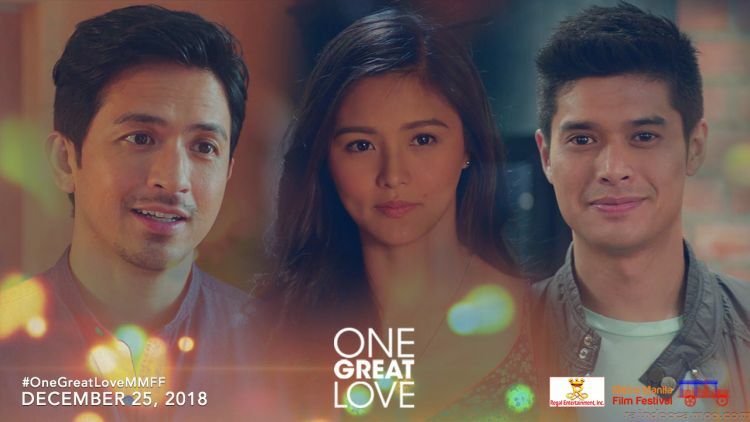 This Christmas, the film production outfit is bringing together a stellar cast from two major TV networks to breathe life to one great movie, entitled One Great Love. Top-billed by celebrity A-listers Dennis Trillo, JC de Vera, and Kim Chiu, the romance drama film, a hugot – bangon film that tackles a subject that everybody is highly familiar with and which we can all relate to: love and relationships. The story tackles about love, which remains to be one of the greatest mysteries up to this day. Falling in love with someone is one thing, but staying in love with that person is another story. Kim shows a different side of her in this movie. Mainly known for tackling romantic-comedy roles in movies, Kim goes out of her comfort zone and portrays another mature character. The bubbly bungisngis Kim Chiu will not be seen in Zyra, her character in the movie. She is expected to have love scenes in this film. ABS-CBN premier artist Kim Chiu portrays the role of Zyra Paez, a woman fortunate enough to know and be with her one great love. JC portrays the role of Carl Mauricio. Carl’s turbulent past has left a scarred, and in the process, keeps hurting the woman who did nothing but love him over anything else. Kapuso dramatic actor Dennis is Dr. Ian Arcano, a heart doctor who firmly believes in the sanctity of family and keeping it that way. Ian is a dependable friend to Zyra, but then eventually falls in love with her. The lives of Zyra, Carl, and Ian are intertwined with one another in a story that reveals to us that like every human being, we all seek for love, but our views about it differ. “Magagaling lahat dito umarte. Baka makakuha sila ng awards. Totoong magagaling. Maganda ang pelikula para sa pasko. One Great Movie to watch out for,” says matriarch Mother Lily Monteverde. The movie helps us understand ourselves through the characters: are you the type to cling to someone you love no matter what or are you willing to let it go for someone you love? The film also stars Eric Quizon portraying Dante Paez, Zyra’s loving father, who never got over of his One Great Love, discovers that he deserves a second chance at love. Nina Dolino as Annie Paez, Dante’s second wife, who is a firm believer that One Great Love exists. Miles Ocampo is Jemi Paez, sister of Zyra and who is mature for her age. She is a practical thinker, who challenges Zyra’s view about love. Marlo Mortel is Bryan Gomez, a loving free-spirited guy who falls in love with Jemi. Directed by Eric Quizon, One Great Love opens in cinemas on December 25.